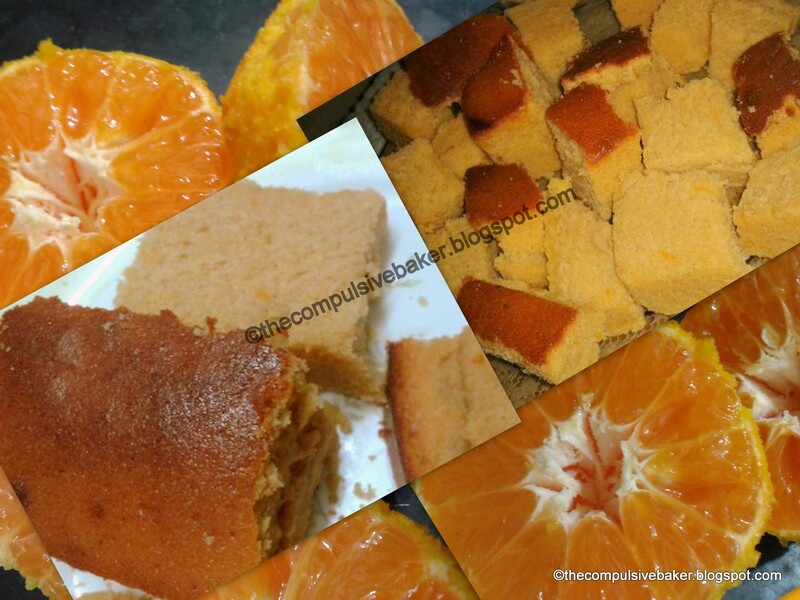 The Compulsive Baker: Orange Marmalade Cake - Citrus Mania - One and only of its kind !! Orange Marmalade Cake - Citrus Mania - One and only of its kind !! Whole Wheat and Oranges - Can't get better than this ! Get set for a fresh burst of orange in your mouth...its like drinking out of an orange deodorant or eating an orange scented candle...Baking this cake is just as easy as peeling an orange - no creaming , no folding and even though it is Whole Wheat, just like every other cake of mine, it is so soft and 'melt-in-your-mouth' that for a moment you might not want to believe me. I have also baked these into mini muffins...power packed with the goodness of oranges and Whole Wheat. I am sometimes tempted to mash a banana into this batter, because, one - banana keeps the cake moist even after a few days of baking these, and, two - I love the merger of these two flavors. But I restrain myself because I think the Orange is the king here and should be allowed to rule the Kingdom of Flavours in this cake. Handy Tip - If you don't have Orange Marmalade, use 1 cup ( 8 fl. oz.) of freshly squeezed orange juice with the pulp and the rind. So you will have only one cup of wet ingredients as opposed to 1 and a 1/2 as in the original recipe. Grease and line a baking pan ( I used 8" x 6"). I prefer lining my pan with a baking sheet for any fruit or vegetable cake for ease of unmoulding. 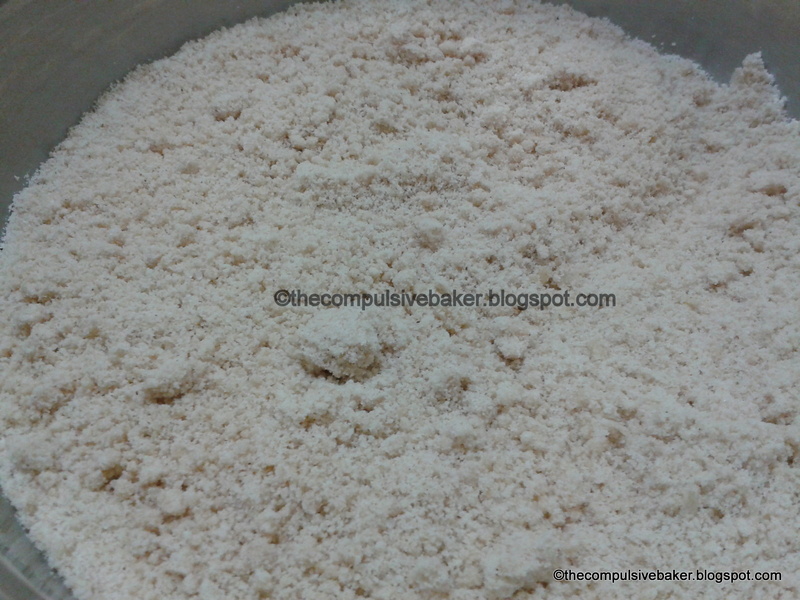 Place all the dry ingredients into a large mixing bowl and mix it evenly with a fork or with hand. 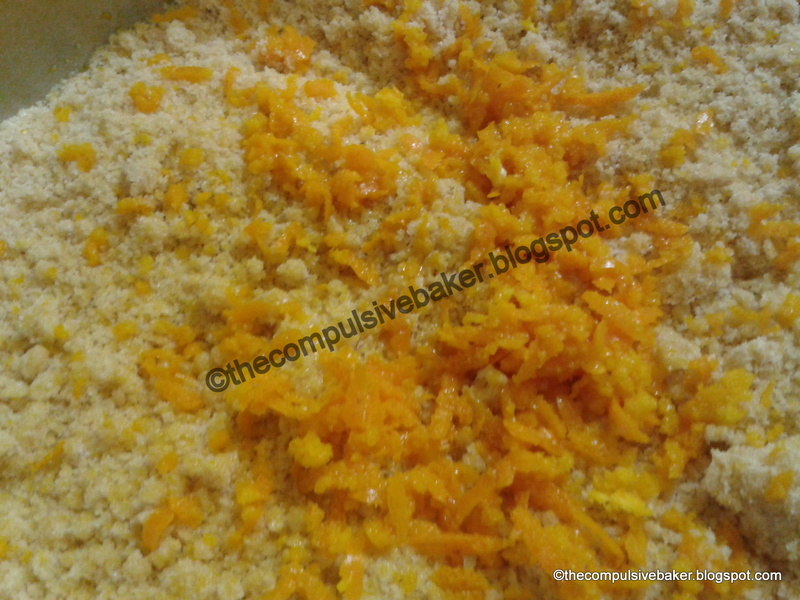 Add the butter and mix thoroughly ( with an electric blender or manually) so that it resembles coarse bread crumbs. Doesn't take too long to do this manually, just a couple of minutes. 4. Grate the rind of an orange into the mixture. 5. From this point onwards, take out your electric blender with the paddle attachment or use the wire whisk for mixing the batter manually. 6. Combine vanilla, melted and cooled orange marmalade and orange juice. Add this to the dry ingredients and mix.Make sure there are no lumps. 7. Add the eggs, one at a time, and mix well after each addition. 8. Keep scrapping the sides while mixing and blend till all the ingredients are well combined, no more. That should take anywhere between 5-7 minutes if done manually or even lesser if you use a machine. 9. Pour into the prepared an and bake at 180 degree Celsius for 35 minutes or till a tooth pick comes out clean from the center of the cake. 10. Unmould as soon as you can and cool on a wire rack. If you have used a baking sheet to line your pan, then you can unmould the cake faster ( within 5 minutes of taking out of the oven). Otherwise wait for the cake to loosen from the bottom and unmould. 11. Cool and slice. Serve warm right out of the oven. 12. 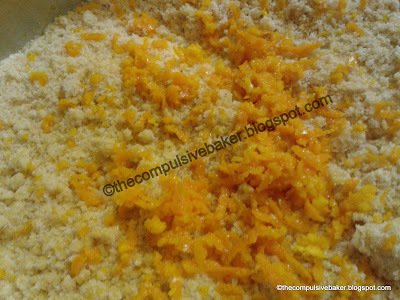 For more orangy flavor melt some orange marmalade and pour over the cooled cake. Or make an Orange glaze - Mix 1 part of orange juice with 1/4 past of sugar and simmer over a low flame till it thickens or reduces to 3/4 the original quantity.